“The situation at hand is asking you to express your thoughts. In the past, you have tried to maintain peace by staying quiet or swallowing your words. Have faith that open and honest communication can bring resolution to the situation. If you are not sure where you stand; ask. since this card is about communication, it may indicate someone’s words have created a moment of clarity. Be willing to communicate your concerns clearly. Remember to be open to others’ point of view or arguments. Let your emotions flow without trying to block them while looking at decisions and solutions. 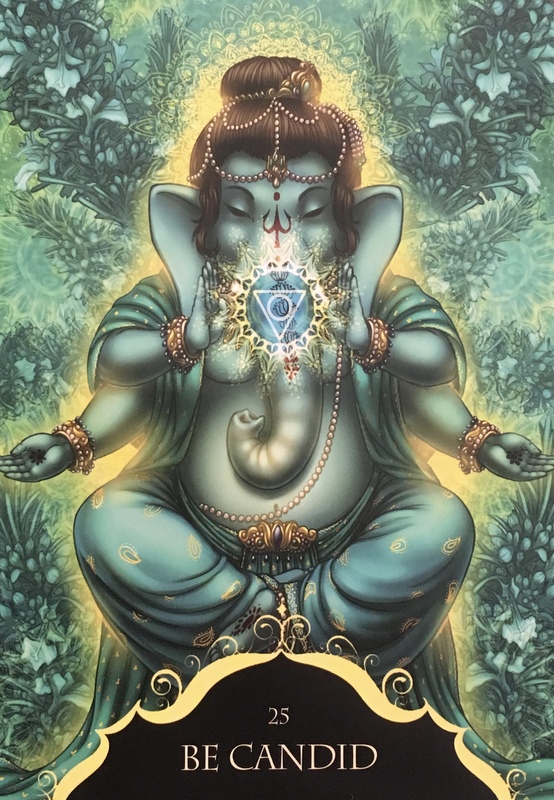 Ganesha prompts you to be wary of coming across as rough or uncaring when you communicate your concerns and ideas to others. Before you express yourself, take a deep breath and think of what you are going to say. Convey your thoughts in an understandable, brief and well thought out manner. Again we are met with the Truth. The importance of being candid, honest, of not staying quiet, not stuffing our truth. This will become part of the collective consciousness, this need for Truth, it is part of the Great Awakening. We will find our Truth and stand together. We will not back down. Our Great Mother Gaia needs us to stand in the Truth for her, and we need to do it for ourselves too. It will quite literally divide us. It will become a matter of Life and Death, of ascension and of staying in the third dimensional consciousness. The Truth will remove the veils. The Truth will give us the strength to stand peacefully yet powerfully for what we believe in. We must embrace it, not cower from it. We must demand it as we freely give of it. There is simply no other way. Ganesha is the breaker of obstacles. He is here to assist us to discard anything that is not in our absolute Truth and bring us back to pure authenticity. It may mean getting uncomfortable for a while, until all the Truth comes out. But then, it will be so transformational, we will wonder why we did not embrace the Truth sooner.